Of course, we can tell you how wonderful we believe our practice is. 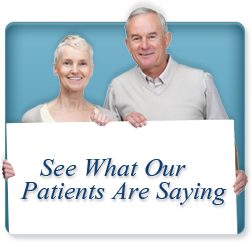 But nothing can give you more insight into our team’s top-notch care than comments from our happy patients. Read on and see for yourself what our patients have to say about the treatment they received from Scottsdale Dental and why they think we are one of the best dentists in Guelph. Last week was the first time I came to the office. Previously, I had been with the same dentist for 20 years. The hygienist put me at ease and explained what she was doing during the cleaning. I was a little apprehensive because after a cleaning at my previous dentist I always had a lot of blood in my mouth. Dr Ahmad took the time to speak me after and answered all my questions. What impressed me too, was he did not rush the conversation. That was a welcome change from my previous dental office experiences. Staff are always welcoming and friendly. Very nice office with tablets to use while waiting. Dr. Ahmad is knowledgeable and down to earth, answering any and all questions - nice to chat with. Gentle and patient with children. Our family is happy at Scottsdale. Having recently moved to Guelph, we needed to find a new dental clinic. We are so very pleased that we discovered Dr. Ahmad and his dental clinic! From the warm welcome we receive at the reception desk, to his knowledgeable and friendly staff and to Dr. Ahmad's kind, warm, and extremely competent manner, we can highly recommend Scottsdale Dental Clinic!! I love this clinic. Everyone is exceptionally professional and nice. I usually hate going to the dentist but the hygienists are so friendly and gentle that I actually look forward to going! I appreciate their reminder protocols as well. I highly recommend this office! I am new to Guelph and only been here twice, but my first impressions are that this is a very well run office. Booking/rescheduling is easy. The staff are friendly and helpful. No issues getting through to reception when calling. My hygienist is very nice, professional, and knowledgeable. I only met Dr. Ahmed once but he was great as well. I have been recommending this place to anyone I know looking for a dentist.